Kristen Stewart is funky and edgy with this modern twist to “the Shag” hairstyle. 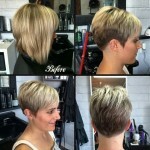 Extreme layering throughout the hair adds texture and body. Layers are cut from approximately eye level, using a stylist’s razor. The hair is given a liberal amount of volumizing moose and very roughly blow dried, using fingers to tousle and flick. As there is plenty of layering the hair will flick naturally, so there is no need for a round brush while blow drying. However, if you are after that “Farrah Fawcett” flick, using a round brush on the ends of the layers while blow drying, will give that effect nicely.